"Margaret - we discussed this in our one on one - the team is doing agile now, so please put the phone away and join the stand up meeting." 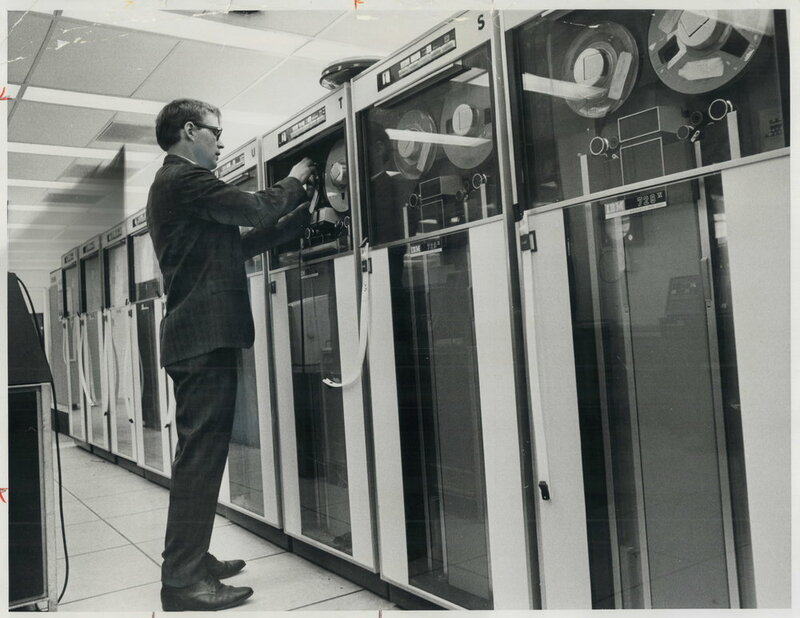 The IBM 729 magnetic tape unit used 1/2 inch magnetic tape wound onto reels up to 2400 feet. The tape had seven parallel tracks, six for data and one to maintain parity (BCD character data were recorded in even parity whereas binary used odd parity). The recording density was 200 characters per inch, and initially the tape speed was 75 inches/second, so the transfer rate was 120 kbits/second. Later models increaded the transfer rate to 480 kbits/second. A single 2400 foot tape could store about 3 MByte. Each tape would replace about 50,000 punched cards. It would take about 250 tapes to fill one CD. The IBM 2770 Data Communication System was introduced in 1969 as an integrated suite of products. Click next and previous buttons on the image to peruse the manual. 2772 Network maximum speed: 2400 bits/second. The IBM System/370 Model 168 was announced on Aug. 2 1972. The memory was "four-way doubleword interleaved" and could be 1 up to 8 megabytes and offered "tightly coupled multiprocessing". The related IBM 3330 family of disk drives featuring removable disk packs with up to 200 megabyte capacity, the console printer could output 85 characters per second, and the system console included a light pen and a microfiche document viewer. The System/370 Model 168 was finally withdrawn on Sept. 15 1980.